Our medical education program echos a Doric order where the ethicality and civility’s dome is secured by columns symbolizing mortal anatomy. Columns represent working systems of the body such as muscles and urogenital systems. These systems display differences in a period. The basic education administered in the early years will fall in and combine with discipline acquired in consecutive years. Public health, research, ethics, and professionalism are the main factors which constitute medicine. These are the very elements which attach the base and the main dome of our Doric style educational system. Accordingly the above mentioned elements and main factors are repeated through the duration of all branches of medical profession. Students are well versed on detection, diagnosis, and therapeutics of public health. On designing the program, we had our sights set on training the students to implement scientific mechanism in their written and verbal correspondence. İn like manner we aimed at coaching them in application and evaluation of data collected by conducting diverse research methods. Many subskills have been included under the ethicality and civility dome of our curriculum’s structure. To turn students into skilled professionals, they are trained in many techniques such as communication skills, conduct of medical activities in public, even as much as the internalized ethical values. Our faculty’s syllabus is mainly based on four anatomical parts of human frame, syllabus have been integrated both horizontaly and verticaly. 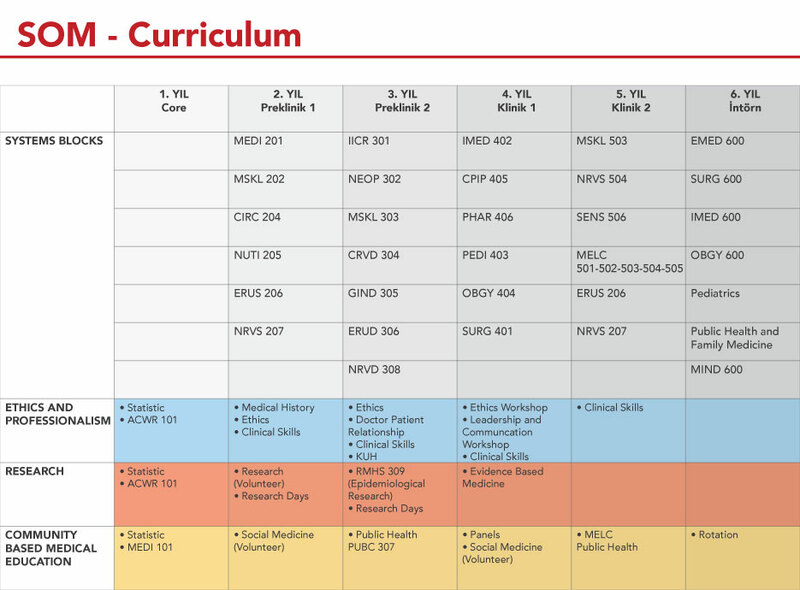 According to this fundamental frame, the syllabus of the medical faculty has been broken down into academic years.